I want to see your Pony Rooms! A Really Big Anime/Manga Fan! moved out of this house :ipmimscs: but we get to be in the new house. and my mom in the top part of the same house. here are my WIP pics of my ponyroom. i will get new pics up because i have moved more stuff around the room. This is SOOOOOOOO last year as I've added a bunch more AND another shelf too that houses my SO SOFTS (G3), but you get the idea of my room/office. I will hopefully be working on an updated version soon. I know how it feels to wait though. When we moved down here from WA, I had to be without my collection for more than HALF a year. Most of them were stored away in a building somewhere far from my reach. It's really hard...I know, but it'll be worth it in the end. Good luck with the transition!! gah! Jewel what do you mean! Those are great! nice, when i look at these pics it helps me to get idea's in my head when i get my pony room. They're kinda out of order, but you'll get the idea. "Woosie's My Little Pony Customs"
oh my god how do you both have sweetheart sister carousel ponies?! There were three of them in total - in pink, purple and yellow. 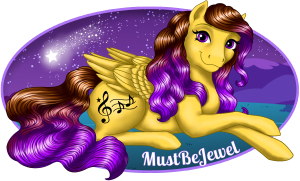 They were put on eBay and I won the pink one, Mustbejewel got the purple one and a collector that isn't on the pony boards (or at least not back then, she may have since joined without my knowledge) got the yellow one. is it bad to ask how much they set you back? Great post, i just got to clean up all the drool. here is a link to my stuff. any day jewel or woosie wants to give me those huge commercial pony's. please just ask. Yeah that sounds right I think it was like $500ish plus shipping? Yours had to go a lot farther than mine did, though. My dad helped me out with mine too! Then dad kindly reminded them that this 200-lb "horse" had to go up two flights of stairs. Hehe. I love it though, it's the centerpiece of my collection. And it's purple--can't beat that! Those are truly 2 very original pony collection pieces. I would so love to get my hands on one. yeah wow... haha I live in Florida! Shipping wouldn't have been so bad for me! He sent some of his employees down to the inner harbor to pick her up when she shipped, and he kept them in suspense as to what it was. These gruff guys were all super excited about what was in this mysterious box, and they opened it as soon as they got it to the house. My dad owns a cabinet building business so the freight company delivered to his shop as it was MUCH cheaper than delivering to a home address. But when the delivery guy got there he DROPPED it off the back of the truck and it got pretty damaged, lot of paint cracks and a chip off of her nose and ear where it bumped up against the wooden crate. My dad about murdered the guy, lol. Ouch, yes I remember that.. Did you ever get her fixed, or figure out a way to? I would have been absolutely furious, to put it lightly. Here are current photos of our basement. Please ignore the mess, as it's still a work-in-progress (going on 3 years now). These are my second FAVORITE types of posts here at the TP! My first favorites are when people really get talking, like if there's something new pop up, or something like that, and people get really excited, and you see some collectors climb out of the woodwork too. 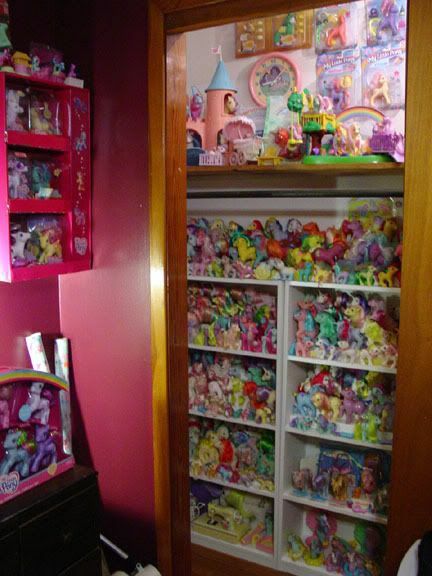 Anyway, mine's more of a pony closet, but I'll share anyway! The G3 side is different now, and never was that great from the start, but here it is anyway!